Shake well before drinking. Once opened, keep refrigerated and consume within 3 days. Ingredients: Water, Aqueous Extract Of Green Tea And Jasmine (36%), Cane Sugar, Flavouring, Antioxidant (Ascorbic Acid). 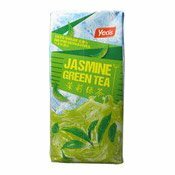 Simply enter your details below and we will send you an e-mail when “Jasmine Green Tea Drink (茉香綠茶)” is back in stock!